False dragonhead (Physostegia virginiana) is the real thing if you're looking for weed control and a pretty addition to your garden. 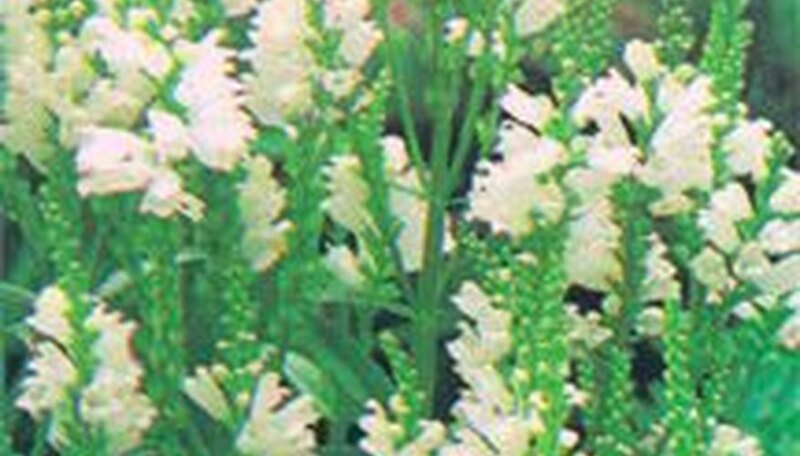 A member of the mint family, False Dragonhead is a North American flower so named because it is similar (but in a different genus) to the Eurasian "true" dragonhead flower. Its bloom supposedly resembles the open mouth of a dragon. Also known as an Obedient Plant, False Dragonhead flowers will stay in position if pushed on the stem to face a new direction. Hardy in Zones 2-10, False Dragonhead will prosper almost anywhere. It grows from Canada to Florida, likes swamps or prairies, does well in full sun or part shade, likes rich well-drained loamy soil but will do okay with sandy soil. Otherwise unfussy, it does prefer moderate moisture, so this summer's wet conditions have been ideal for it. The erect stems grow about 18" to 3' tall, bearing willow-like dark-green leaves and delicate spikes of buds that look like they're never going to bloom. Then suddenly they erupt with snapdragon-like flowers that range in color from white to pink, lavender and purple. The long-lasting flowers start blooming in August and continue through autumn here in Maryland. A perennial, False Dragonhead needs to be divided occasionally. Do so in the spring. It can also be propagated by root cuttings and seeds. Forming a tall groundcover, it forms thick patches that spread by rhizomes and squeeze out weeds. I like that! It is useful in another way: it attracts bees. Besides serving as weed control and attracting pollinating bees, False Dragonhead is lovely in the border and also makes a wonderful cut flower. Maybe the best news of all (for some of us, anyway): it is deer resistant. About the Author Carolyn Proeber (pronounced PRAY-ber) is an experienced gardening columnist based in Salisbury, Maryland. She lives with her husband Dave and their three children (Sheila, Tim and Zoe) near the Chesapeake Bay in gardening Zone 7b. She is also an artist, keyboardist and personal fitness trainer.